Multifacited ministry makes an impact on its community in Jesus' name. Since it was founded in July of 1999, Cornerstone has led 113 people to Christ. The journey began in 1994 when Marcus Lane felt called to ministry after completing the study course “Experiencing God.” Lane and his wife, Patty, began doing street ministry and started an early morning bible study at a nearby fast-food restaurant. The study quickly grew to about 20 persons each morning, many of whom were homeless or on public aid. The following year, Lane began to lead missions activities at his home church, Calvary Baptist in Alton. By 1998, the church began to feel a persistent call to make a greater evangelistic impact on its community, and Pastor Andre Dobson asked the missions committee to come up with a plan for taking strong action. In January of 1999, the committee unveiled its plan for cornerstone, and the church asked Lane to head up the new ministry. Calvary had owned a building next door to the church for nearly ten years; the plan has been to demolish the building to allow for expansion. But city ordinances made the plan impractical, and the church had been uncertain about what to do with the property. Located at Washington and Brown streets, one of the busiest intersections in Alton, it became obvious that the building the church had purchased so many years before was the perfect home for the new outreach ministry. In July of 1999, Cornerstone opened its doors, and a large; polished-granite marker was later set in front of the building to mark the occasion. Cornerstone has taken full advantage of its high-profile location. Many junior high and high school students walk by the building on their way to and from school each day, so volunteers run an after school outreach several days a week. Students participate in recreation activities, receive help with their homework and interact with adults who strive to share with them the love of Jesus Christ. Each December, Cornerstone constructs a live nativity scene in its parking lot. The scene includes a large stable, which is stocked with live animals including sheep, cows and even an occasional camel. Cornerstone volunteers portray Shepard, wise men, Mary, Joseph, and baby Jesus. The attraction draws hundreds of viewers every year, including many who just happen to be driving by. Volunteers mingle with visitors, distributing literature that reveals the true meaning of Christmas and seeking opportunities to share the gospel and talk about the ministries at Cornerstone. Cornerstone’s annual block party is also a major event; free food, music, and entertainment drew over 1400 visitors to the Cornerstone parking lot. The newest and fastest-growing outreach is their ministry to Madison County jail facilities. Lane has been a jail chaplain for several years and recently gained unprecedented access to the Madison County Juvenile Detention Home. Since August 2002, 16 teenagers have prayed to receive Christ. The Left Behind book series as well as the Christian classic The Cross and the Switchblade have been widely distributed in the facility and have been instrumental in leading many troubled teens to ask questions about the end of the world, the bible, and Jesus Christ. “One Saturday last December, a 17 year old young man prayed to receive Christ while reading his Left Behind book” Lane said “I was able to follow up with an explanation of what he needed to do next and helped him set up a bible study plan. The day after we did that, he was transferred to an adult facility, out of the reach of our ministry.” This young man represents the 48th salvation to come as a result of Cornerstone’s prison ministry. Different forms of counseling have also been part of the Cornerstone package from the very beginning. Twelve-step programs, post-divorce counseling, grief counseling, and especially financial counseling are all offered free to those in need. Each Wednesday morning the Cornerstone lobby fills with people who cannot pay their utility bills, feed their children, or meet other basic needs. Volunteers interview each applicant for assistance and come up with a plan to improve their situation. The car that Cornerstone had gave this man came from yet another of its ministries, Car Care. Area residents are encouraged to donate their used cars to the ministry to help those in need, and each year dozens of people respond. 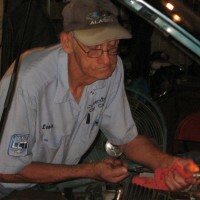 The cars are reconditioned and repaired by tireless Cornerstone volunteer Louis Hartwick, a certified mechanic with over 30 years of experience, who donates two full days each week to the ministry. Hartwick also makes repairs for Cornerstone clients who cannot afford them, whose jobs would be in jeopardy because they have no other way to work. “I’m glad to do it, glad that God gave me a way to serve Him” Hartwick said “It’s a privilege to be here doing this work for Him.” God’s provision has been evident in the ministry. In its brief existence, Car Care has provided over $250,000 worth of vehicles and repairs to the people it has served. For two years, Hartwick did his Car Care work in a small residential garage a few doors away from Cornerstone. The garage was schedule was scheduled for demolition to make way for expansion at Calvary Baptist and Car Care had no where to go. About the same time, a home that bordered the other side of Calvary’s property was offered for sale to the church to allow for eventual expansion of the parking lot. Unknown to the church, a small commercial garage with three bays was on the back part of the property, and it became the perfect new home for Car Care. The new garage needed some repair, but again God provided. “We needed a rather expensive new garage door and the winning bid was from a company that was owned by Christians from another church here in town. After they completed the work they called us and told us there would be no charge, that the new door was a gift to our ministry.” Lane said. Networking with area businesses and churches is one of the things Cornerstone does best. When a repair job is too big for Car Care, local dealerships and repair shops will often step in to help, doing jobs for free or at a drastically reduced rates. A dozen churches in the area representing five denominations work closely with Cornerstone, referring clients and providing funds for their care. Cornerstone has established relationships with utility companies and local landlords, helping to work out plans for keeping warm and sheltered while setting up schedules to repay their debts. Government agencies and area charities also interact with Cornerstone to more effectively serve those in need within the community. Cornerstone has quickly gained a good reputation throughout Madison County, and Lane is recognized as a Hometown Hero at an awards ceremony last fall. The community service award was given by a committee of business and public service leaders in the Alton area, and Lane was recognized as the outstanding Man of Faith for the year. Another important counseling ministry at Cornerstone is Divorce Care, which has utilized a video series to help people work through the pain of divorce. Volunteers lead the Divorce Care ministry. “It’s a safe place to share,” a volunteer said. “It’s a regular time of the week to examine this painful aspect of your life. At Divorce Care, each lesson takes us through another stage in the process of healing, and in the meantime we bond with each other and encourage each other to practice what we learn.” Divorce Care members come from all over the area to participate. During a recent interview with the group, two women indicated that they drive all the way to Missouri to come to Cornerstone. “My church does not offer anything for people like me,” reported one woman, “and the other churches who do charge about $150 for each twelve weeks. When someone is going through divorce, you just can’t afford to pay for the help you need.” Another woman agreed, “This group has helped me more than anything else. I was in bad shape. I was scared when I came here the first time, but I have not missed a session ever since.” Another participate added “It’s the spiritual help that makes the most difference for me. Divorce Care helps me know how to recover. Though I’m not there yet, I know the help I get here is better than anything the outside world has to offer.” Cornerstone plans for other Divorce care locations around Madison County and is seeking churches to partner with in this effort.